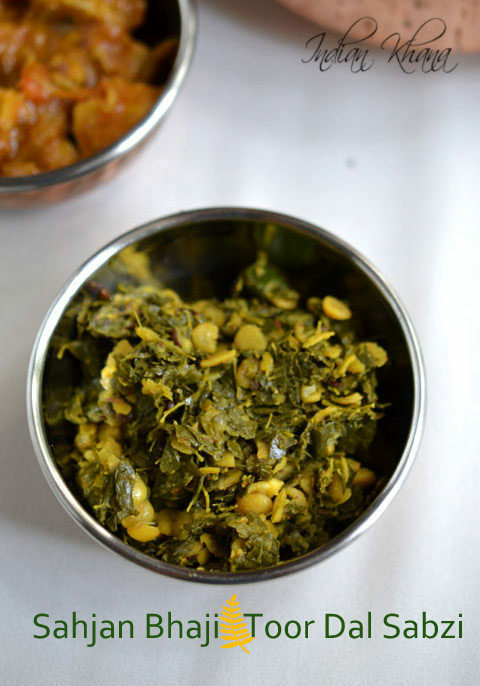 Sahjan Bhaji Toor Dal Sabzi or Drumstick Leaves Split Pigeon Peas Curry or we can also say it's Murungakkai Keerai Kootu though it's drier than normal kootu. 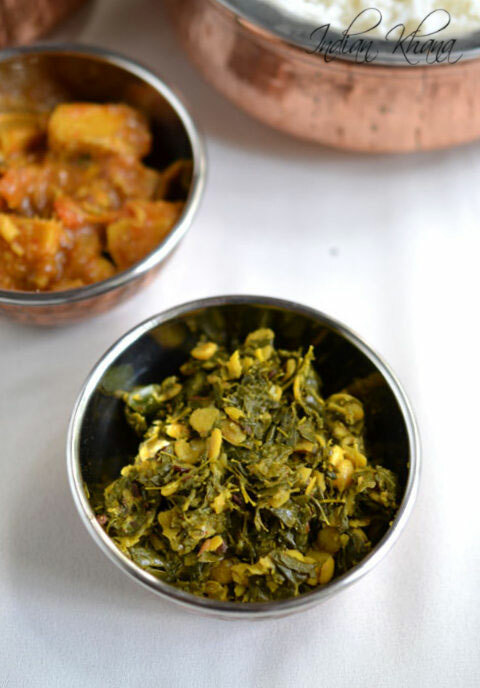 This bhaji recipe I learnt from my MIL and normally from drumstick leaves this what is made like I mentioned in my drumstick leaves adai, drumstick leaves rasam posts this is the recipe I was talking about. This recipe is really easy and taste delicious. 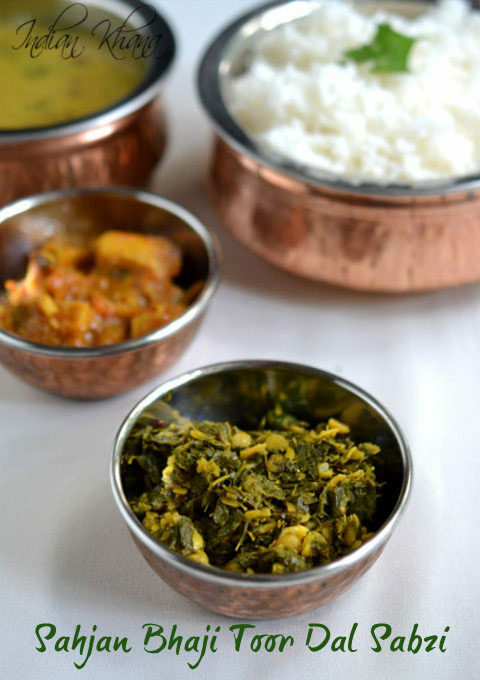 The procedure seems long but if we do it with proper planning then it can be done with ease and taste really delicious just follow the steps and don't cook dal, drumstick leaves together it makes the bhaji bitter in taste. Trust me this is from experience so normally what I do is since anyway we have to make dal I cook little dal extra for the bhaji and with remaining I make normal dal for the meal. Another key point in this recipe is not to mash up the dal and then it taste better than the mashed version. These pictures are not really best of way to show how good this recipe is but just bear with me and try once you will love it. That particular day I made Varan Bhaat, Pumpkin Taro Curry along. 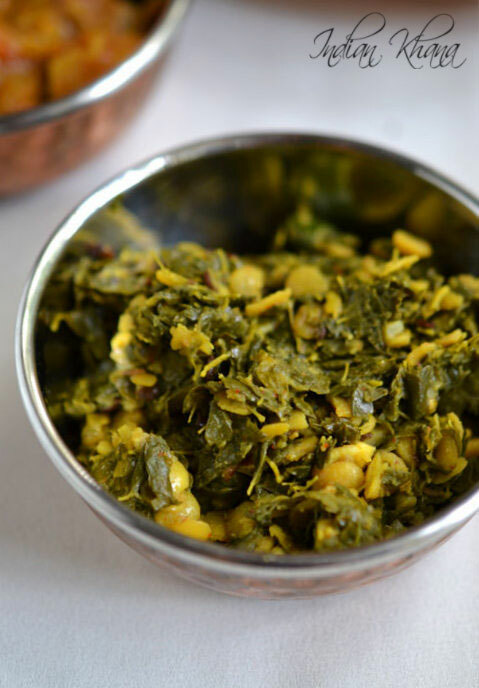 Drumstick Leaves cooked with Split Pigeon Peas (arhar dal) for simple yet delicious side dish. Wash and soak tuvar dal for 15-20 mins and meanwhile clean drumstick leaves. Pressure cook dal for 4-5 whistles or until cooked (don't mash dal). Cook drumstick leaves with little water until soft and all water gets evaported. In a pan or wok heat oil add cumin seeds, garlic and saute until garlic becomes light brown, add dry and green chilies, saute until light brown. Add cooked dal (do not mash it), cooked drumstick leaves, salt and mix gently. Cook for 2 minutes or until it becomes dry, off flame. Do not cook dal and drumstick leaves together, it makes the curry bitter. Do not mash dal while cooking. You can replace green chilies with dry red chilies. 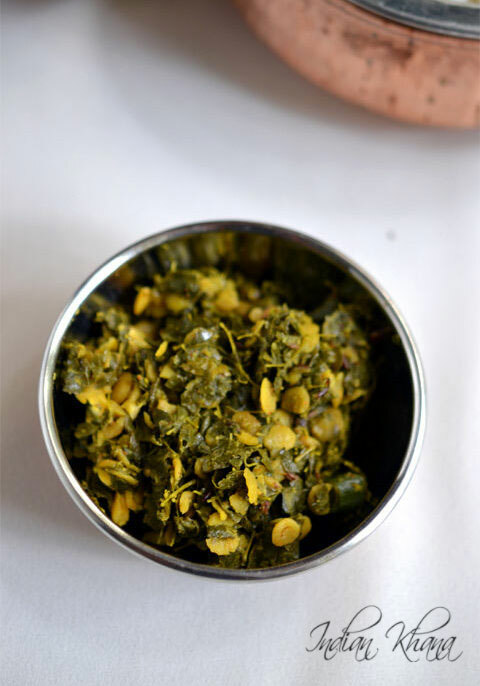 Healthy, delicious drumstick leaves with toor dal bhaji.